We’ve had an amazing month here at Cutting Edge Brides, welcoming lots of brides to be to our Bridal boutique. Over the month we have shared tips and ideas based around your wedding day. There are lots of 1950s style wedding dresses for you to choose from. You will have noticed we were lucky to share four gorgeous brides with you, all wearing different short wedding dresses. If you missed anything over the month then sit back, grab a cuppa and have a read. We started the month with an amazing city wedding with an Italian influence. Sara and Luca had an intimate London wedding. Sara wore Polly a short vintage style-wedding gown by Timeless Chic. Sara was blown away from the compliments she received whilst wearing her short wedding dress. 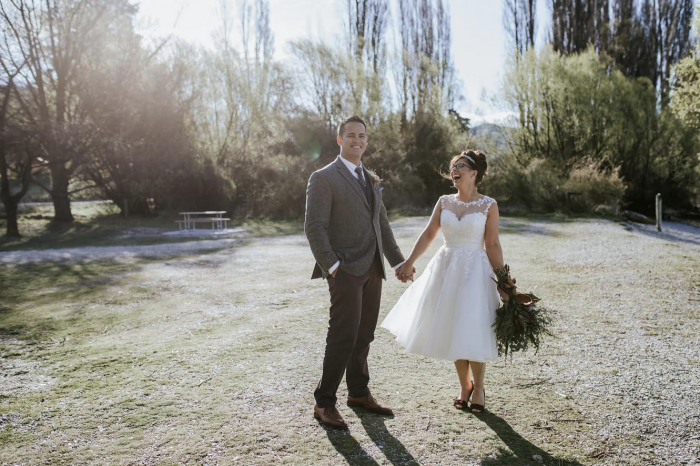 Heather and Robert got married at Coromandel Peak, Wanaka New Zealand. Their elopement location was simply stunning. Heather mixed business with pleasure when she came to London for work and left with her short wedding dress. The bride loved classic styles and chose Molly Mae, Brighton Belle from True Bride. She channeled an elegant Audrey Hepburn style. Isobel and Andrew married in Oxford and their wedding focused on their dual nationalities. Isobel had an idea of the sort of vintage style wedding dress she wanted but left with something quite different. She chose Margie by Loulou bridal which had an off the shoulder sleeve detail and a full tulle calf length skirt. Maddy and John’s wedding day was all about the reception. The bride wanted a dress she could dance in and Nellie by LouLou was just right. It is a stunning Polka Dot Vintage 1950s Inspired Tea Length Short Wedding Dress with Short Sleeves. Maddy had her wedding gown customized to suit her style with longer sleeves and back detail. This month we shared lots of elements of our wonderful vintage reproduction wedding dresses. There were three capped sleeved 1950s style wedding dresses and some classic wedding gowns from Loulou Bridal. We showed you how to mix the five elements of a short wedding dress to create the perfect wedding dress. There was also ideas on what to wear as a bride to a registry office wedding and also we had six different short wedding dresses for more mature brides. There was also a blog post on what is the best style for you. In the wedding planning series we showed you what to do with only 3 months to go. There were ideas around confetti trends and gift lists with a poll on Facebook showing our brides to be feel they don’t need more gifts. Wedding days can be stressful so it’s a good idea to think about a wedding survival plan. If you would like to find your perfect short wedding dress, we have 1950s style wedding dresses for every bride to be. Why not book your one to one consultation today. Our wealth of knowledge to help you find a gorgeous short wedding dress right for you.